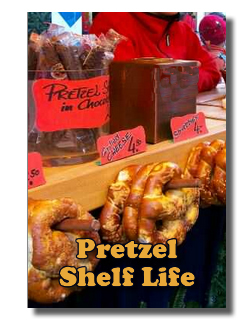 What is the shelf life of chocolate covered pretzels? What makes chocolate covered pretzels stale tasting after a short time? Should I use non-salted pretzels? Should I not refrigerate them until the chocolate is firmly set? What is the proper storage procedure for the chocolate covered pretzels to keep them fresh the longest? What type of chocolate pretzels are you making? If you are completely covering the pretzels, they should keep really well whether you refrigerated them while setting the chocolate or not. If you are dipping pretzel rods and leave some of the pretzel exposed, by putting them in the refrigerator to set the chocolate, you may be getting moisture in the pretzel which is causing the pretzel to taste stale much quicker than normal. The shelf life of chocolate covered pretzels should basically be the same as regular pretzels, perhaps even longer. Dipping the pretzels in chocolate shouldn't alter their shelf life except to possibly preserve them even longer. Chocolate has a pretty long shelf life itself. Like regular pretzels, chocolate covered pretzels should be stored in an airtight container for freshness. You can use a cookie tin, a jar, a plastic container, anything that is airtight and that doesn't have a lingering smell. (Smells will be absorbed into the pretzel candy and definitely ruin the taste!). You can make the chocolate dipped pretzels and just let them harden without placing them in the fridge. It may take a little bit longer, but if it's not too hot out, they should set nicely. Thank you so much for the information! Do you think that chocolate covered marshmallows and rice krispies would last just as long as the pretzels if stored correctly?